Put the scooter on the main/center stand and, if possible, start the engine and let if run for 5 minutes. 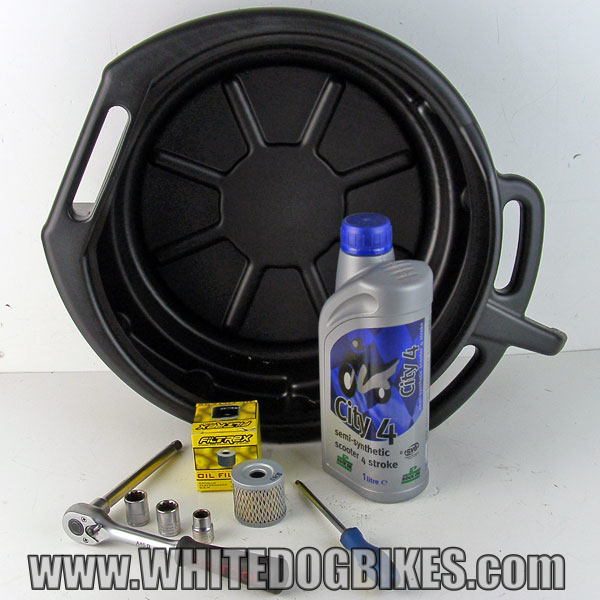 Next, place your waste oil container underneath the scooter and locate the main oil drain plug. 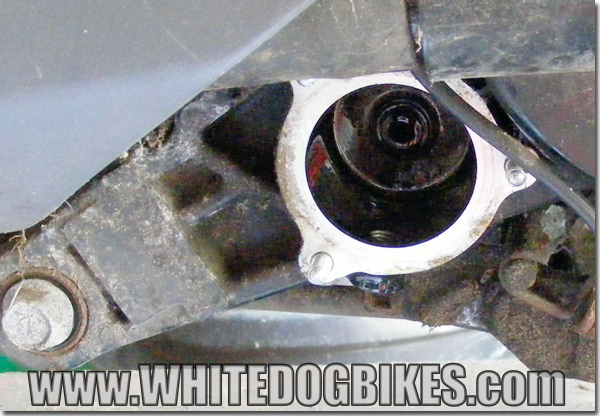 The drain bolt is located in the center, underneath the bike, just behind where the main/center stand attaches to the bike. Tip: As a general rule, almost all nut’s, bolts and screws are loosened by turning anti clockwise (turn to the left), and tightened by turning clockwise (turn to the right). 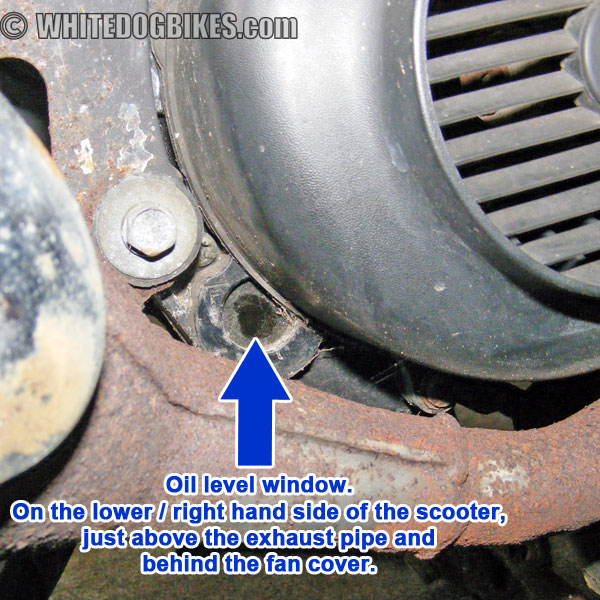 Inspect the oil drain bolt and washer, if there’s no damage screw the bolt back into the engine and tighten with the 14mm socket. 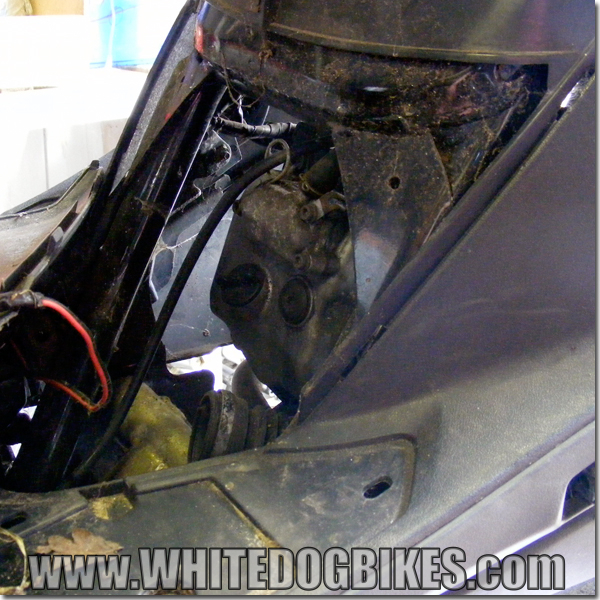 If the threads on the bolt are damaged, or the washer is very pitted or damaged, replace it. 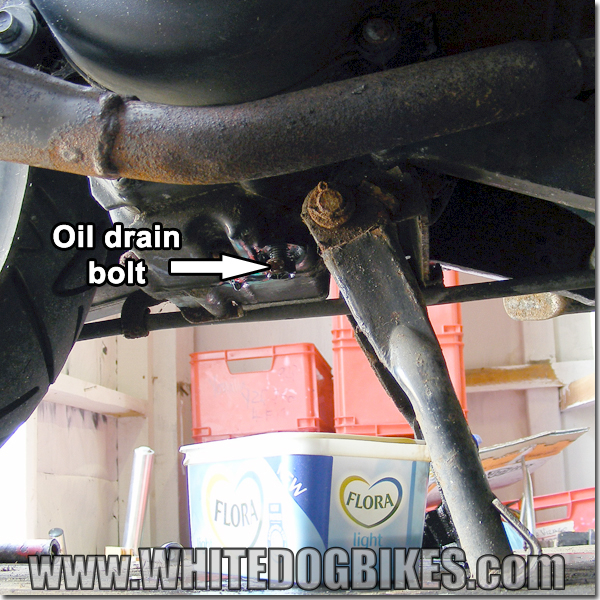 Tip: If your not sure how tight the oil drain bolt should be, an approx guide would be to make sure the bolt (and threads) are clean, then screw the bolt into the hole with your fingers, then tighten it using a spanner or ratchet. When you tighten the bolt with the spanner/ratchet, pull the very end of the spanner/ratchet with your fingers until it just starts to hurt your finger tips, then the bolt should be tight enough (and this will help you avoid over tightening the bolt!). The oil filter housing is located on the left side of the engine, just above the side stand (it’s a round looking panel with 3 nuts holding it on). 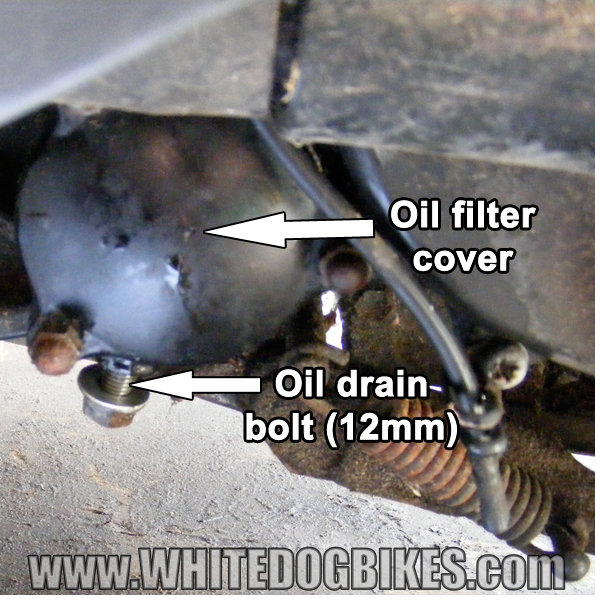 Place your waste oil drain pan under the oil filter housing, on the bottom of the housing there’s a drain bolt for the oil filter, remove this bolt with a 12mm socket (turning anti clockwise to undo) and drain the old oil from the oil filter housing. 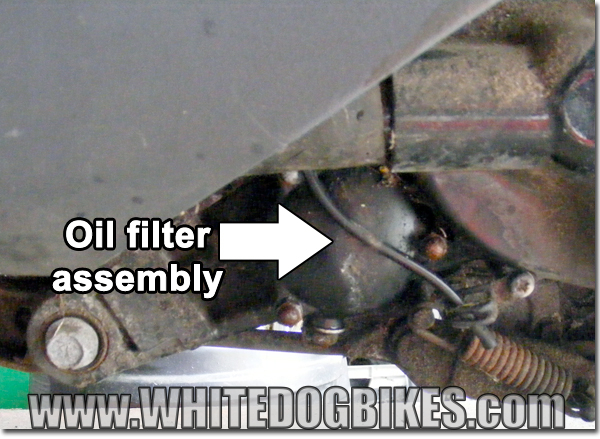 When the oil has been drained, remove the 3 nuts from the outer edges of the oil filter cover to expose the oil filter. 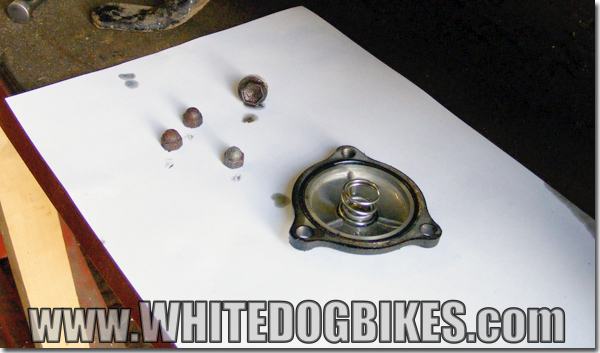 Tip: If your removing or working with small nuts, bolts and parts, lay them on some clean A4 sized paper next to where your working (especially if your working very small parts, e.g carb parts!). It’s much easier to locate things on a clean A4 piece of paper then it is on a dirty workshop surface or floor! Lay out your parts on clean, A4 paper! Remove the old oil filter from the engine (if it’s difficult to get out you can CAREFULLY prise it out with a flat ended screwdriver or similar). 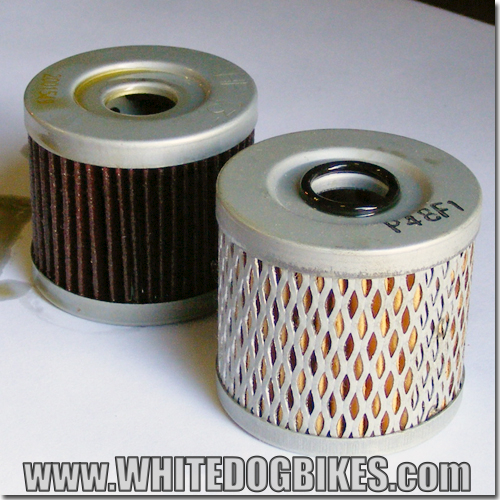 Insert the new oil filter in the housing (the open end of the filter goes into the engine first) and check the condition of the rubber seal on the filter housing cover (and replace it if it’s cracked, split or looks scruffy). Always use a good quality, 10w-40 engine oil! 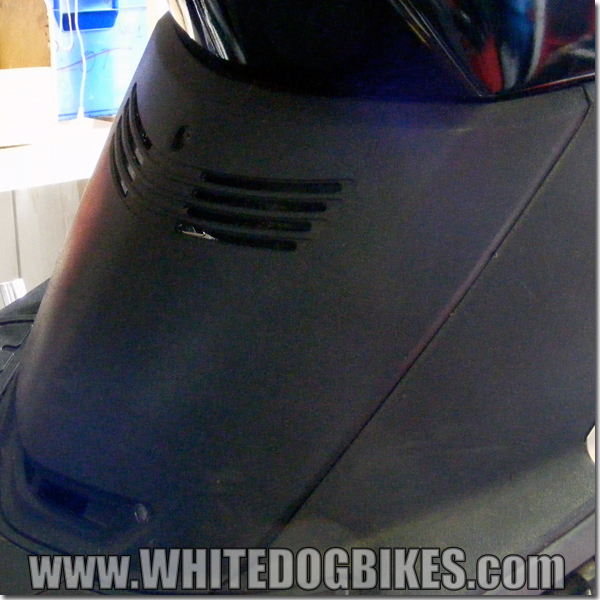 Peel back the rubber cover from the foot panel (the rubber panel that your feet sit on, it’s held in place by some rubber lugs and comes off if you peel it back from the corner). Using a Phillips/cross head screwdriver, take the 2 screws out of the panel on the front, under the seat (the dark grey panel that sits behind your feet. There’s 1 screw at the top and 1 screw at the bottom, under the rubber cover). The panel is also held in by a plastic tab on each side and the air inlet pipe is attached to the bottom (if you lever the panel forwards you can loosen the circlip that holds the pipe in place with a cross head screwdriver and disconnect the pipe). Once the panel is removed, you can see the top of the engine and the screw in cover on the top of the engine. Unscrew the oil filler hole screw (turning anti clockwise) from the top of the engine (it’s the large, black thing that can normally be unscrewed by hand). If the oil filler hole screw is to tight to undo by hand, you can grip the bit you hold between your fingers and loosen it carefully with pliers. 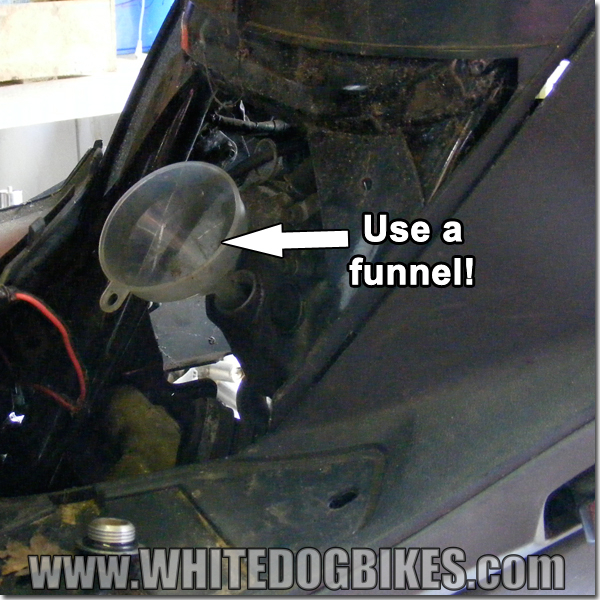 Place a clean funnel in the oil filler hole. 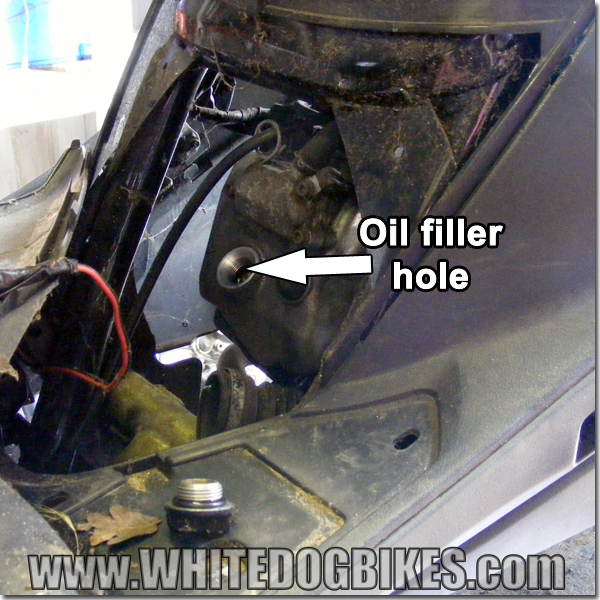 Check the washer on the oil filler hole bolt (and replace if it’s worn or damaged), replace in the oil filler hole. Then re fit the access panel (remembering to re attach the air inlet hose before you close the panel), re fit the rubber mat and you should be good to go! Please remember! 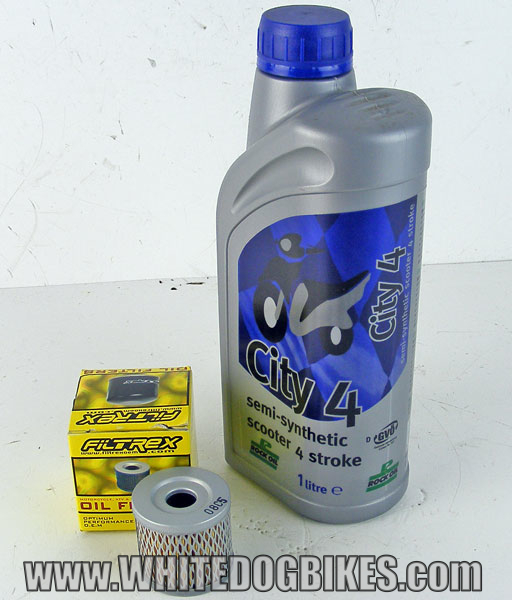 Engine oil is nasty stuff, so please don’t tip your old oil down the drain or into a bush, your local council will be able to dispose of waste oil and filters or your friendly local garage/dealer will probably dispose of it for a couple of quid! Previous PostMobility scooters wanted for cash in Suffolk, Norfolk UK and surrounding areas…..Next PostFiltrex OIF032 oil filter fitment problem…..
Is there a way to check the oil level on the AN 125? I don’t know to be honest, I’ve done a bit of work (oil/filter/plug changes etc) on the AN125 and never found an oil level window or way of checking. I should have a workshop manual coming for the AN125 next week, so if I find any more info I’ll post it up and let you know? If your just changing the oil you would need 800ml of oil. If your changing the oil and filter, 850ml oil. 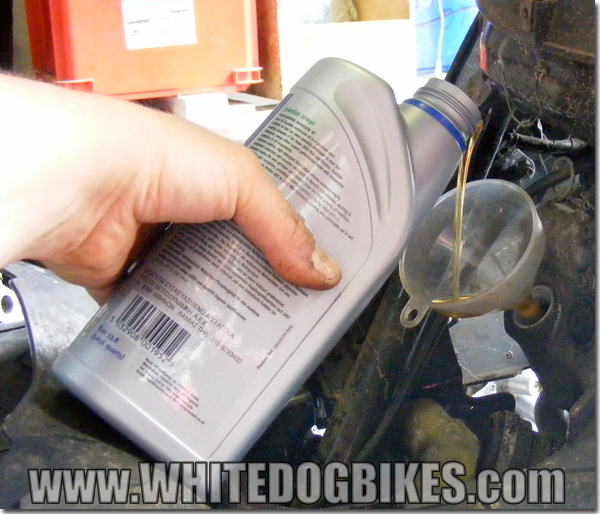 If your striping and rebuilding the engine, 900ml of oil. just want to share. I had a hard time to remove the oil filler hole screw during last service because of the plastic part has ruin and it was to tight. Then I got this idea to use some physics with hot and cold to unscrew it (since both the screw part and the engine are metal). I started the engine till it hot enough (it was quite hot to my finger) and then I put ice cube onto the oil filler hole screw. After a couple minutes the ice cube melted and I managed to unscrew it with little force. 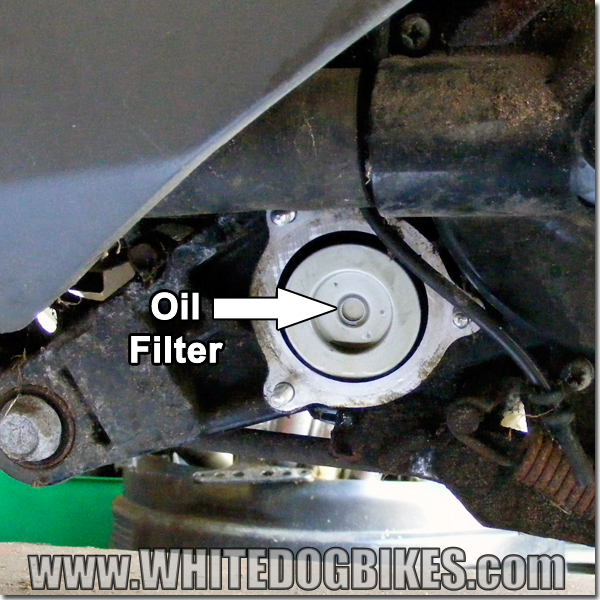 How can i change the gear oil? I think theres normally a small plug on the back of the engine, just behind the rear wheel? 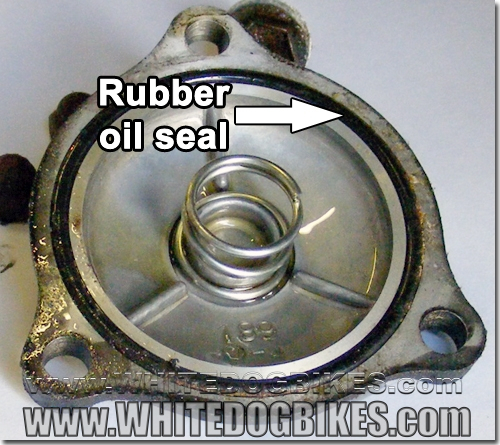 what kind of gear oil do i need for the bike showing ? Any chance of anyone sending me a user manual? There seems to be a few manuals on Ebay? Hi. Just need some information, how about the Gearbox oil? Is it same oil once changing the Engine Oil, it’s had included directly into Gearbox case? Thank you.